Never thought I’d find another quartet of justifications to click a button and shuffle off one’s mortal coil, but it turns out dropping dead on the spot has more combat uses than I thought. And no, ‘cheating your way out of a Holiday Punch tauntkill or Rock-Paper-Scissors loss’ isn’t on the list. People who do that are insultingly lacking in sportsmanship. Reason 5: Give health to your teammates as Scout. Remember the Candy Cane? Some of wish we didn’t. But it has a little-known use for the scout literally willing to die for his teammates; when you hit the suicide button it’ll drop a healthkit for your teammates (or enemies.) The reason behind this is because when you use the ‘kill’ bind you are both the attacker and the victim entity-wise. Does this mean suicides technically improve your K:DR? Food for thought. Remember that unlike in real life, death is not the end. (Unless you’re playing Arena mode.) Especially when in game modes with short respawn times like rd_asteroid or payload offense, suicide can be a quick way to reach your spawn if for some reason you’d like to get back there, perhaps to build a teleporter entrance. In this video, a member of RED team suicides in order to prevent a backcap; had the rest of his team followed suit they might not have lost the match. After this video came out on NISLT’s channel and enterprising reverse engineers figured out what was going on, a quick script “slot3; +attack; explode” started circulating the rounds that let the player keep meleeing while dead. You could even whip teammates from the death cam! I’m honestly not sure if this is still possible. Seems like the sort of thing Valve would patch, but you never know. And even if it is gone for now, who’s to say it won’t show up again? As Buffalo Steak Minigun Heavy has repeatedly proved, a particular class of glitches rarely stay dead forever. Ever since Two Cities gave the Medic the ability to revive his teammates on demand, suicide has entered the meta as a very situational move that sometimes benefits the player. Perhaps you wish to prevent some giant’s knockback imminently flinging and then killing you far away from your teammates, or you’d like to quickly get all your health and ammo back without leaving the front lines. Dunno, but the potential is out there, and when your numbers are 6 vs 666 you need all the tricks you can get. I’ll round this article off by mentioning that suicide had a very important role to play in the Team Fortress Classic meta as well. In that game, respawn was instant, meaning that the flagrunner who successfully finishes the long chain of moving the enemy flag to the capture point usually celebrates by immediately gibbing himself and respawning. This filled two functions; he gets all his health back, and he only has to learn a single rollout (the one out of spawn) instead of spreading his practice over a spawn rollout and a less-used “leaving the capture zone” rollout. If you check out any of the comp matches (this shoutcasted championship is a good start) you can see how every second counted for the scouts and medics. Update: The new weapon-dropping mechanic has added probably one of the most useful tricks involving suicide yet; getting multiple copies of weapons to shuffle around in your inventory. For more information, please read this article and watch this video. Just going to say that that “Hitting people beyond the grave” was patched. There was actually s sub-glitch to it, if you did some fancy script-going, you could switch teams as well and actually teamkill people. It was fun to destroy sentry nests with that. I actually wrangled up around 4-5 people and joined a Saxton Hale server (it has freecam) and had 5 whips just demolishing Hale. The knockback sent him flying! It was incredibly humorous. In terms of the reanimator, there’s actually a few things you can do with it. You can die while on a teleporter, get revived, and then be stuck inside the teleporter. There’s also that pit on bigrock with the killplane at the bottom. 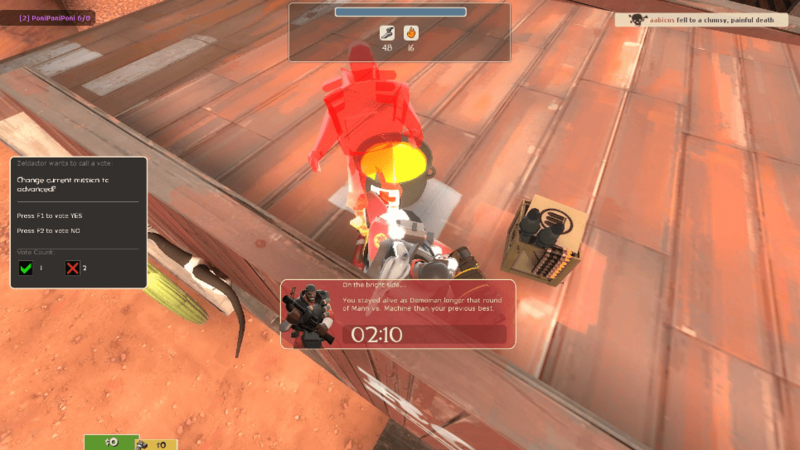 Two medics can quick fix Über each other and get under the kill plane, allowing for other classes (such as the engineer) to suicide and have their reanimator drop below the killplane as well. You’re basically out of map, but it’s completely useless. Fun for messing around with friends, as engineer can build down there.